SALT LAKE CITY —University of Utah Health has been once again named a winner of the prestigious 2017 Vizient Bernard A. Birnbaum, MD, Quality Leadership Award. The award recognizes academic medical centers for demonstrating superior quality and safety performance as measured by the Vizient Quality and Accountability Study, which has been conducted annually since 2005. The award was presented on Thursday, Sept. 14 at the 2017 Vizient Clinical Connections Summit held in Denver. This year, 107 academic medical centers and 161 community hospitals were included in the study, which measures superior performance based on the Institute of Medicine’s six domains of care: safety, timeliness, effectiveness, efficiency, equity and patient centeredness. “What’s so impressive about this ranking is that the Vizient study is based on actual care delivery – not reputation. It’s an “apples to apples’ comparison of academic medical centers, which care for the most complex and sickest patients in the country,” says Gordon Crabtree, CEO of University of Utah Hospitals and Clinics. “Eight years running is an amazing achievement. For U of U Health patients, the Vizient study means outstanding outcomes whether you’re having a baby or undergoing heart surgery. It also means U of U Health posts low mortality rates and that patients receive some of the safest care in the country. When discharged, they’re less likely to need to be readmitted,” says Robert Pendleton, M.D., chief medical quality officer for U of U Health. In addition to the placement on the top ten list, U of U Health also placed 5th for Vizient Excellence Award for Ambulatory Care. This is the third year in a row the U has been ranked in the top 5. University of Utah Health is the only university health system in the state of Utah, and provides patient care for the people of Utah, Idaho, Wyoming, Montana and much of Nevada. It is the training ground for most of Utah’s physicians, nurses, pharmacists, therapists and other health care professionals. 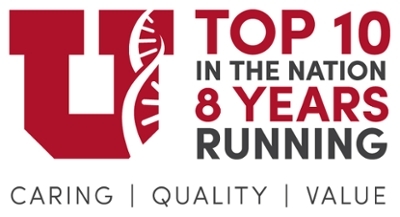 With an annual budget of $3.3 billion (FY16), U OF U HEALTH is a highly complex academic health system comprised of the Hospitals and Clinics; University of Utah Medical Group; Huntsman Cancer Institute; the Schools of Medicine and Dentistry, and in partnership with the Colleges of Health, Nursing, and Pharmacy, tout a $281 million research enterprise; Eccles Health Sciences Library; the Cardiovascular Research and Training Institute; and Associated Regional and University Pathologists (ARUP) in addition to numerous other centers and institutes. Excellence in patient care, education, and research is vital to the overall mission of the organization. Staffed by more than 18,000 employees, U OF U HEALTH has evolved to be recognized nationally as a highly innovative and transformative health care system.